. . .as strong, outside and in, as wood and iron and skill could make her. It need scarcely be said that all the other arrangements about her were made with the greatest care and without regard to expense, for although the owners of the brig did not wish to waste their money, they set too high a value on human life to risk it for the sake of saving a few pounds. She was provisioned for a cruise of two years and a half. But this was in case of accidents, for Captain Harvey did not intend to be absent much longer than one year. Books on tape makes travel better...did you ever wonder if walrus fight back?...amazing stories of survival in the arctic. This is another adventure book for early seafaring days except there is little sailing in this book. It is more about the year they spend in the artic with the ship frozen in the ice. They even make contact with a village of natives which brings out a lot of interesting views of natives. Too much "remembered" dialogue in this tale for my tastes. But it probably was the style at the time. A short, easy read. Love the subject matter. 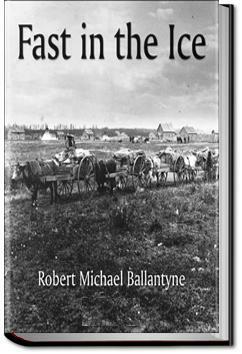 Anyone who is interested in survival in the Arctic will enjoy this book. I've read a fair amount about the Arctic, and for a novel, "Fast in the Ice" is pretty accurate about the conditions explorers experienced.